Home sales in Southwood in 2012 will record their second worst year since homes 2002. As we head into the last week of the year in 2012, only 99 homes have sold and closed in Southwood. 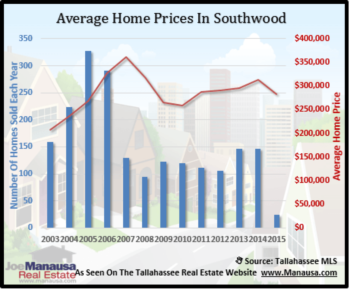 Currently, there are 55 homes for sale in Southwood in the Tallahassee MLS, and distressed home sales are not out of control, posting a small decline in 2012. Southwood Home values declined 1.8% in 2012, all the while new construction prices were on the rise. Will we finally see new construction die down in Southwood in 2013? It is highly likely that we will see Southwood home values decline in 2013, as distressed properties for sale will have far less competition from new home sales. 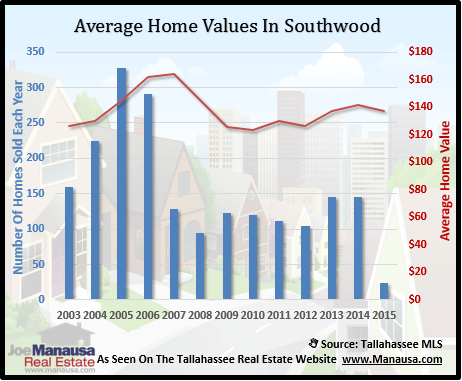 I hope you enjoyed our year end report on home sales in Southwood, please return again to find more Tallahassee neighborhood reports. Something is off in your chart. Between 2001 and 2011 there were almost 1500 new homes built and sold in Southwood. The numbers listed for new home sales don't seem to reflect that. Chris, I'm travelling right now and do not have access to my database, but I suspect the answer lies in the data source. The graph you are looking at is what is contained in the Tallahassee MLS, so not all sales are present. Many new home sales occur outside of the MLS.